Are you one who loves greenery a lot? Are you one who would love to have a garden but cannot have one only because there is no space around your home? If the answer is yes, then don’t fret at all. We are here to help you out with our list of 10 amazing and top designs of green rooftops. Yes, rooftops! Who says that we cannot utilise the space of the roof that receives abundance of sunlight almost every day? With a little effort and creative mindset, we can definitely transform our rooftops. 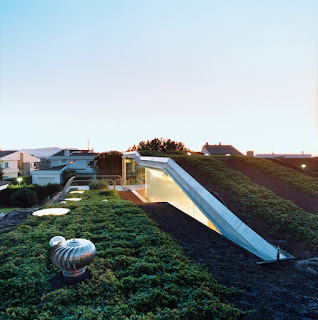 A green rooftop reduces the cost of maintaining ambient temperature inside the home. It also encourages the local wildlife and also filters the rainwater harvested at the roof. 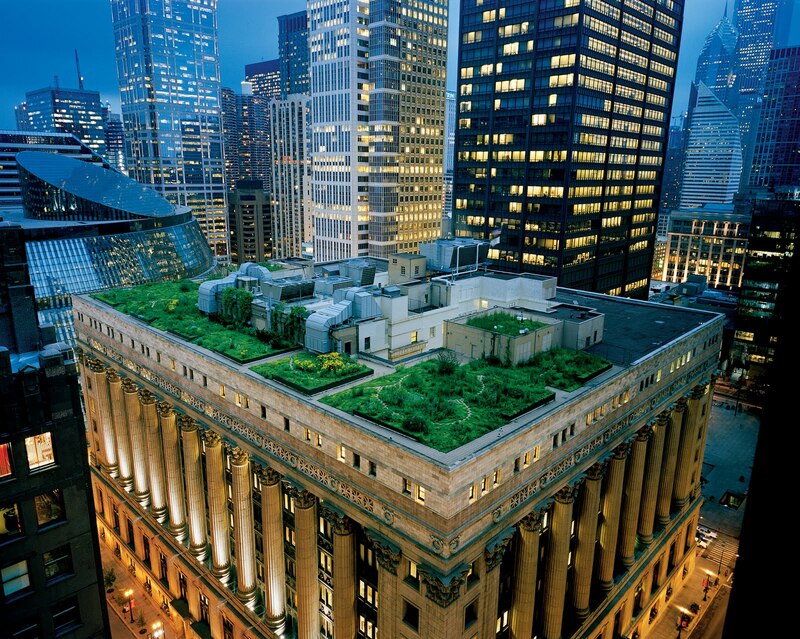 Let’s look at the stunning pieces of architecture of green rooftops. The Villa Bio by Enric Ruiz-Geli is bound to leave you spellbound. It not only complements the local landscape but also gives a modern touch to its locality. 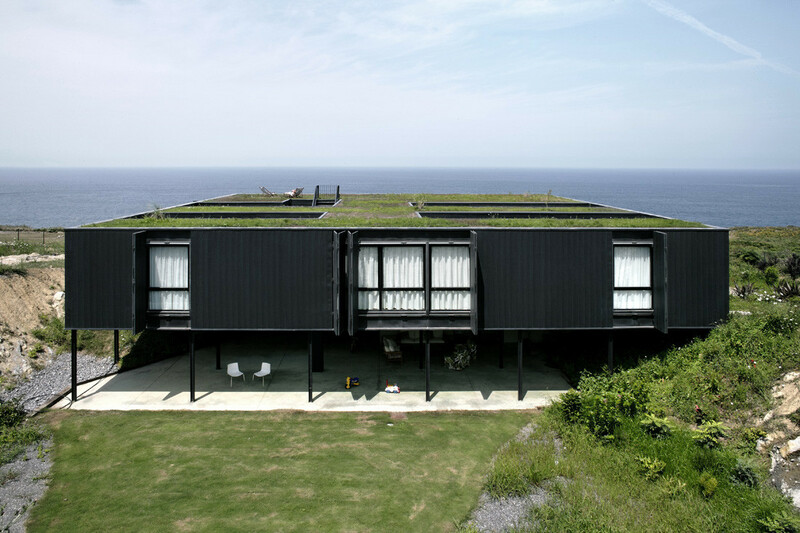 The hydroponic garden creeps along the roof and renders an amazing look to the home. Not a single person will be able to comment standing in front of the house that it has a rooftop garden. But the green rooftop is simply amazing conceptually and aesthetically. This is a concept of green roof that you can adopt for your home too. 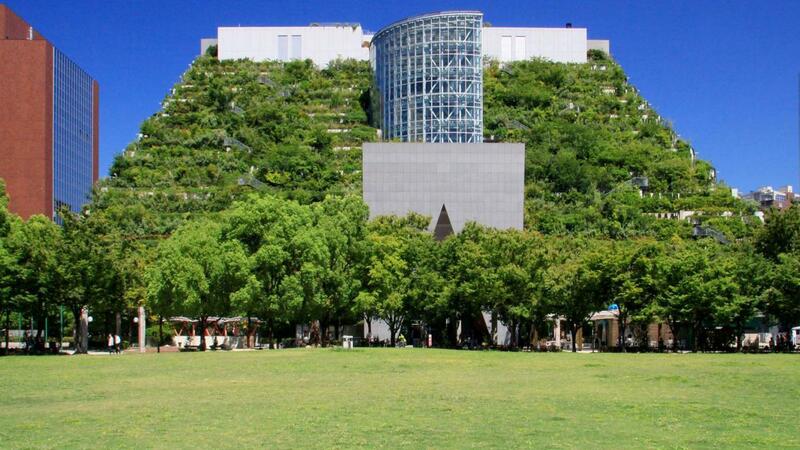 This green rooftop is not only a green concept but also a stunning piece of artwork. Seeing the design for once will leave in a state of bewilderment as to how this rooftop has been created. 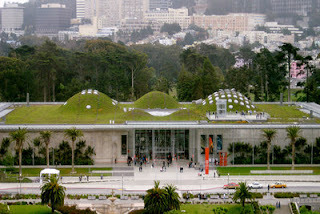 The California Academy of Sciences is dedicated to the cause of environmental education and sustainability. And what else can depict the world about one’s commitment towards sustainability than a rooftop that can be visible even to the skies and aeroplanes? 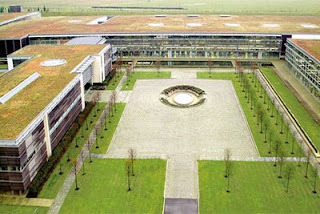 With the intent of sustainability and reduction of carbon footprint, the academy is fitted with an amazing green roof. It gives an altogether different visual appeal and makes the building look stunning. 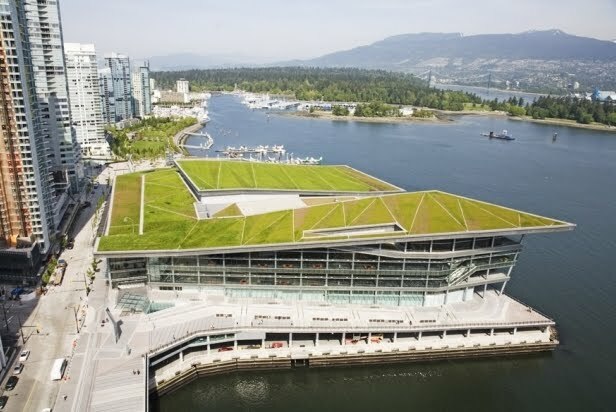 The Vancouver Convention Centre is not only a great venue to hang out, it not only houses a green rooftop, but it is also an award winning, state of the art, green-designed building. The green roof that covers 6 acres of area is home to many indigenous plants and has also been awarded the ‘Go Green certificate’ for industry approved environmental best practice. 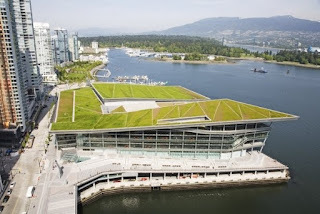 In case you are wishing to roam on a huge tract of land that is essentially a roof, or if you are a builder looking for inspiration in sustainable design, get hold of the architect of the Vancouver Convention Centre. Let’s keep talking a bit more about award winners. 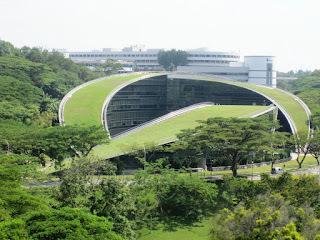 The Nanyang Technological University at Singapore is the home to one of the most iconic designs of a rooftop and that too, a green rooftop. Completed in 2006, this building fits in superbly with its local landscape and covers a total of 10,000 square metres of land. If you are designing architecture for a university, you know what can be your new muse. The building is a five-storey structure and the rooftops are two curved sections open to all students. The rooftops protect the building from heating up and also collect rain water for landscape irrigation. 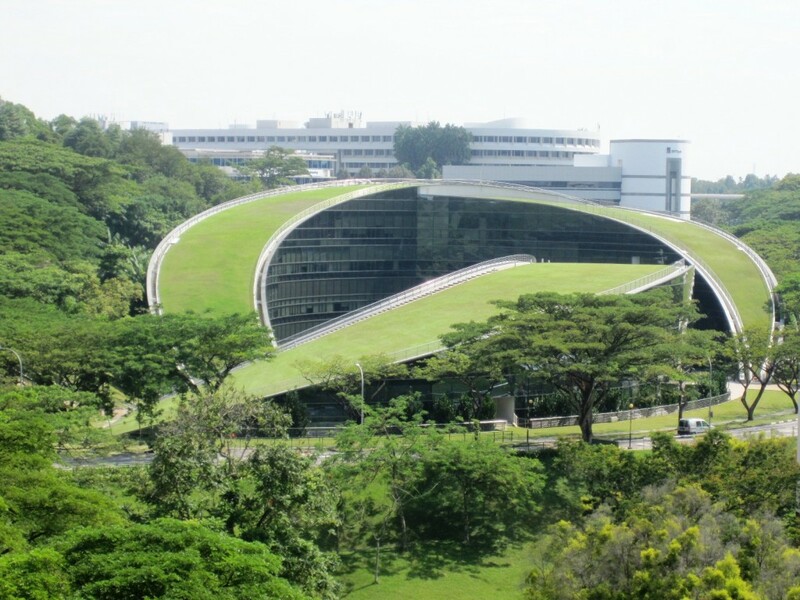 See how the Nanyang Technological University, Singapore has blurred the line between landscape and building. The building stands as an amazing example of amalgam between nature and human construction. Now here comes an inspiration. How many buildings actually dedicate them for motivating others? Very few! The Green Technology Showroom shows to the world the benefits of green rooftops and other green practices. 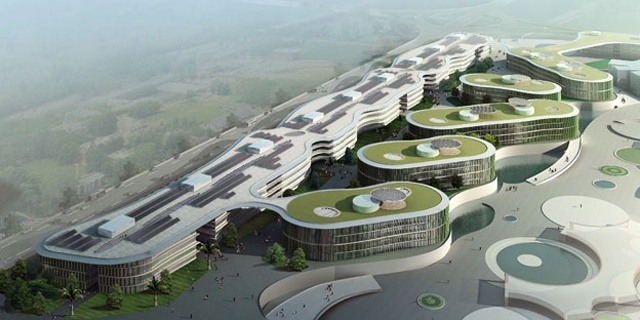 The design by Vector Architects communicates the values of eco-design to the public. The walls and the roof are covered with a thick blanket of climate controlling grass attached to the inner steel skeleton of the building. China has got this in a residential development serving as an example of sustainable design and ecological success. So you thought that business parks are only about industries standing like concrete blocks covered with shining blue-green glass? Can a business park not be green at all? If you think it cannot be, then it is time to change your mind. Come and visit the Expo Zaragoza Empresarial Business Park in Zaragoza, Spain. It was built in 2008 for a sustainability exposition and now it boasts of 50,000 square metres of green space which is much accessible to the common public. The historic centre of Zaragoza is at just 15 minutes distance from this business park that stands as an amazing example of green architecture. If you ever happen to visit Spain, please do visit this business park as it can inspire your next green rooftop. Rolls Royce is not just about fuel guzzling monsters running on the road and polluting the environment. Rolls Royce’s commitment towards sustainability and green practices can be seen very well in the design of the rooftop of its factory at Goodwood in United Kingdom. Back in the year 2002, Rolls Royce had erected a sedum roof to make the factory look appealing and first to the tranquil surroundings. The place where this factory is located is picturesque in beauty and the Rolls Royce Factory stands as an outstanding piece of architecture as it sports a beautiful green rooftop. This building serves as an example of how factories can also adopt green roofs with little efforts and an attitude of eco-friendliness. Do you want to see green stairs? Don’t think too much as I am not taking you to mountains to show you step farming. Rather, I am taking you to Japan. You will be mesmerized to witness the grandeur of Fukuoka Prefectural International Hall – Fukuoka, Japan. There are 15 green stepped terraces. The building is famous for having overcome two challenges at once. The first challenge was to maximise the space for commercial use and the second one was to satisfy public’s need for open spaces. Visit Fukuoka Prefectural International Hall to get away from the congestion of the cities and to relax a bit and immerse in nature. How would you like the idea of being surrounded by water and enjoying the harsh coastal winds? Yes, even the harsh coastal winds of Spain can be enjoyed when you are in OS House created by NOLASTER Architects. The building blends well with the topography of the place and is centred in water. 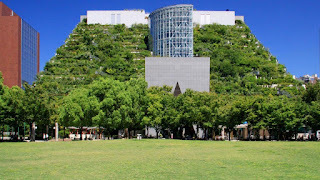 The green rooftop is soft, grassy, habitable and a perfect place to revel in nature. Would you like to have a similar green rooftop for your home too? This building made in the hilly areas is a perfect place to spend your vacations. The structure comprises of three sections and each has its own green roof. The green roof has the capability to control the cooling and heating costs and to stimulate the habitat of local Mill Valley wildlife. 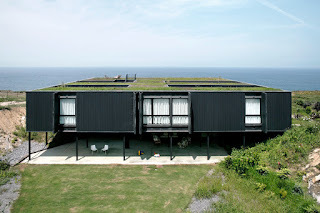 This way, the green rooftop controls the temperature of the home, adds to the visual appeal of the house and sets itself as an example to be followed by all house designers and architects. 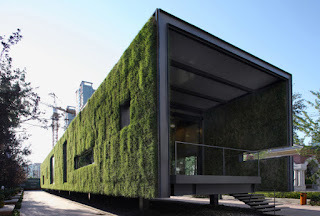 So, now when you have seen the designs of green rooftops, is there anything that is stopping you from having one?